Our test results indicate that the new Apple MacBook Airs ran faster than all but one recent netbook or ultraportable from Windows PC manufacturers. We already know the 2010 MacBook Air models significantly improve on the previous generation in overall performance, but how do they stack up against Windows 7 laptops of similar size? Judged solely on performance, they dominate. With Windows 7 running on Apple's featherweight machines, our test results indicate that the new Airs ran faster than all but one recent netbook or ultraportable from Windows PC manufacturers. The PCWorld Labs team used Apple's Boot Camp to load Windows 7 on new 11-inch and 13-inch MacBook Air models. Then we benchmarked them using our WorldBench 6 test suite and using the games Call of Duty 4 and DiRT 2. The result: For their size, the Airs are hard to beat on raw performance. Their battery life is relatively anemic, however, especially when compared to netbooks. And—no surprise—they carry a significant price premium. First we tested a high-end 11-inch MacBook Air packing a 1.4GHz Core 2 Duo processor, 2GB of RAM, 128GB of flash storage and an Nvidia GeForce 320M integrated graphics chipset. We purchased our test unit for $1199, a much higher price than most Windows netbooks fetch. But in light of the size similarities, we compared it with some of the top-scoring Windows netbooks of 2010. 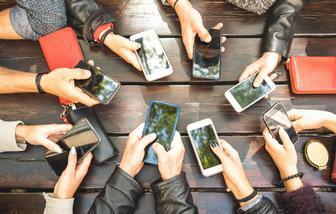 Our WorldBench 6 software runs systems through a timed gauntlet of popular consumer applications such as Adobe Photoshop and Mozilla Firefox, compiles the results, and spits out an overall score. 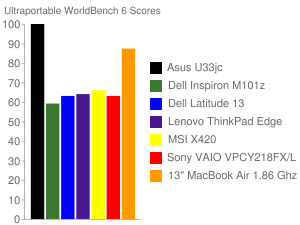 The 11-inch Air earned a WorldBench 6 score of 74, very impressive given that the average WorldBench 6 score of the netbooks we've tested recently is 45. Even more impressive was the 11-inch Air's performance in our gaming tests: Most netbooks can't run 3D games like DiRT 2 and Call of Duty 4 at all, but the Air managed to sustain a frame rate of 23 frames per second while running COD4 at 1024 by 768 resolution and high graphic settings; much of the credit probably should go to the Nvidia GeForce 320M graphics card, which comes standard in every Air model. Unfortunately the Air's integrated battery performed with far less distinction. The 11-inch Air lasted almost 4 hours before the battery gave out, whereas the average battery life of recent Windows netbooks is 6.5 hours, and some do a lot better than that. The 10.6-inch Gateway LT2118u netbook, for instance, lasts nearly 11 hours on a single battery charge. The MacBook Airs cost considerably more than most Windows netbooks. The Gateway LT2118u, for instance, costs just $350—less than a third of what the 11-inch Air we tested costs. And both the $400 Asus Eee PC 1015PED and the $600 HP Mini 5103 lagged only a few points behind the Air in our performance tests, yet both of these 10.1-inch netbooks are priced at less than half what you'd pay for an 11-inch Air. The 13-inch MacBook Air we tested came equipped with a 1.86GHz Core 2 Duo processor, 2GB of RAM, 128GB of flash storage and the Nvidia GeForce 320M. We ended up paying $1299 for the machine. 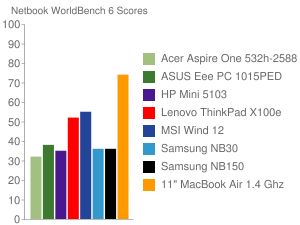 The 13-inch Air easily outpaced the original MacBook Air (which we tested in 2008) on our WorldBench 6 tests: 90 to 57. The new 13-inch Air also compares very favorably with contemporary ultraportable laptops, which have an average WorldBench 6 score of 74. In fact, among our top 10 ultraportable laptops only the Asus U33jc outperforms the 13-inch Air, speeding to a mark of 103. In our gaming tests, the 13-inch Air turned in a solid frame rate of 25 fps while running Call of Duty 4 on high settings at a screen resolution of 1024 by 768. In contrast, the $999 Asus U33jc topped out at 20.4 fps in CoD4 under the same conditions, and the gaming-focused Alienware MX11 ultraportable ($1299) holds the top spot with an average frame rate of 41.8 fps. PC users are conditioned to accept poor battery life on larger laptops as the price of bigger screens and beefier components, but the 2010 MacBook Air line bucks this trend: The larger 13-inch Air boasts a bigger battery and better power performance than its 11-inch sibling. The 13-inch Air lasted 5 hours on a full charge under laboratory conditions, close to the 5.5 hour average of other ultraportable laptops. In fact the 13-inch Air lasted longer than either the $500 Dell Latitude 13 or the $600 Inspiron M101z while outperforming both by a wide margin. Such competitive performance makes the new 13-inch Air an excellent choice for anyone seeking a lightweight MacBook to tote in a backpack. Of course, consumers who aren't married to the Apple aesthetic can secure a machine with comparable performance for a lot less: The slightly more powerful Asus U33jc costs $999, and the slightly less powerful Lenovo ThinkPad Edge runs $799. If you're undaunted by the Air's price tag, don't ignore some design idiosyncrasies that might get in your way. The Air has neither an optical drive nor an ethernet port, presumably so that Apple could keep their machine as slim and light as possible. An ethernet port is standard on Windows laptops; and though the lack of an optical drive isn't unusual in a small notebook these days, many ultraportables do have them. Still, if you're comfortable with working over Wi-Fi and with spending a grand or more on a thin, light notebook, you'll be hard-pressed to find one that outperforms the MacBook Air.